Makes the Legion as strong as they\'re said to be. 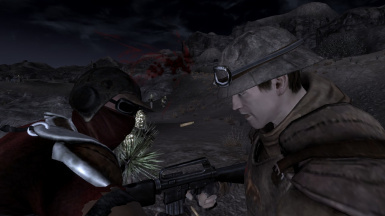 Bethesda/Obsidian for creating Fallout: New Vegas. Legion Rebalanced is a mod that edits the inventories and stats of members of the legion to be more lore-friendly. This mod was created to keep the vanilla look of the legion, but make them lore-friendly through their stats. If you're looking for a mod that changes the look of the legion, check out Caesar's New Regime or Caesar's Legion Overhaul. In terms of NCR improvements, I would recommend checking out ADAM or NCR Rearmament. The Legionnaires will still give you or the NCR the challenge needed with those mods activated. - Various Health improvements on higher ranking Legionnaires. - Machete's damage changed from 11 to 20. - Recruit Legionnaires receive a perk that increases their melee damage by 10. - Prime Legionnaires have a randomly selected ranged and melee weapon arsenal. - Prime Legionnaires receive a perk that increases their melee damage by 15. - Veteran Legionnaires have a ranged weapon arsenal, as well as their melee weapon arsenal. - Veteran Legionnaires now level with the player. - Veteran Legionnaires receive a perk that increases their melee damage by 20. - Centurions, Praetorians, and Vexillarius all have 20% Damage Resistance. - Centurions speed is set to 140%. - Centurions receive a perk that increases their melee damage by 30. 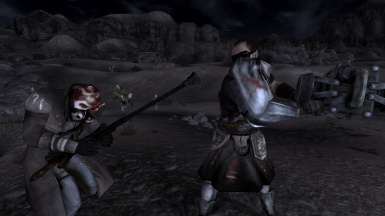 - Praetorians receive a perk that increases their unarmed damage by 30. - Vexillarius receive a perk that increases their melee damage by 30. -Installation: Just extract the files provided into your data folder. - Version 2_1 is the current version and does not require Version 2 to run. - Do not use 2 versions of this mod together. -Uninstallation: Delete the LegionLoreFriendly.esp file. - The meshes in V2 are a placeholder worldmodel for the DamWar Facemask. You can delete that too. - This file DOES NOT work with Factions Reloaded : Legion. You will CTD immediately if you run both. If you have any comments, suggestions, or questions, feel free to post them in the comments section.